Energy efficiency is almost always at the top of a homeowner’s list of desirable home features. It doesn’t matter if you are building a new home or renovating your current home, there are things you can do to make sure your house is utilizing solutions that are energy efficient. Not only will you be doing your part in preserving the environment, you’ll be saving money. We will outline some of the top things you can do to make your home more “green” when it comes to energy use. The U.S. Department of Energy has a system it uses to rate the energy efficiency of a home based on its structure along with the heating, cooling and hot water systems. Before doing any type of construction, whether new or remodeling, it’s helpful to plan out how you will incorporate energy-efficient solutions into the design. For any older home that will be remodeled, you may want to consider having a home energy audit performed before beginning the project. By doing this, you will be able to identify the things that are translating into huge utility bills. Newly constructed homes are inherently more energy-efficient. Beyond the traditional ways of incorporating energy efficiency with insulation, windows, and doors, your home can incorporate some of the newer construction techniques to make it more efficient. 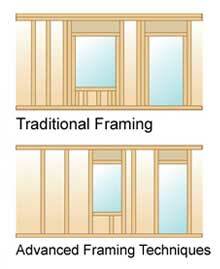 For example, there is a framing method (referred to as advanced house framing or optimum value engineering), that decreases the amount of lumber used while improving energy efficiency. Cool roofs are another solution for saving on energy costs during the hotter months of the year. Highly reflective materials are used to reflect more light so less heat is absorbed from the sunlight. The most advantageous way to incorporate energy-efficiency into your new home construction or remodeling project is to talk with the professionals at Prominent Builders. We have individuals on staff who can work with you to select the “green” features you want in your home. We can also work with your architect to design a home that meets your goals for efficiency and cost-savings.